Let's take a break from all of the Christmas candy for a minute, because we gotta eat dinner too. I have had this recipe saved for over a year and I finally got around to making it. I wish it wouldn't have taken me so long, because it is really really yummy. How could you not love something with cheese and bacon? How is this different from other chicken and rice casseroles? Well, the bacon and the Parmesan are great additions and the cheese sauce has Dijon mustard in it? What? I was worried it would be too overpowering and I added a little less than it called for, but the flavor was amazing. I think I will start adding a little Dijon to all of my cheese sauces. It will be my new secret ingredient! 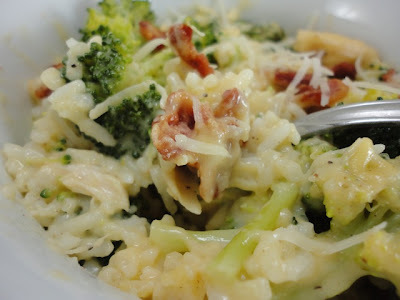 Cheesy Chicken, Bacon, Broccoli & Rice Cass. 1/2 c. Cheddar cheese, grated, opt. Cook bacon in a large skillet over medium heat until crisp. Remove bacon and discard all but 1 or 2 Tablespoons of the grease. Add chopped onion and saute a few minutes. Gradually add flour and whisk until a thick paste forms. Whisk in chicken broth, half-and-half and Dijon and stir until thickened. Stir in cheese until melted. 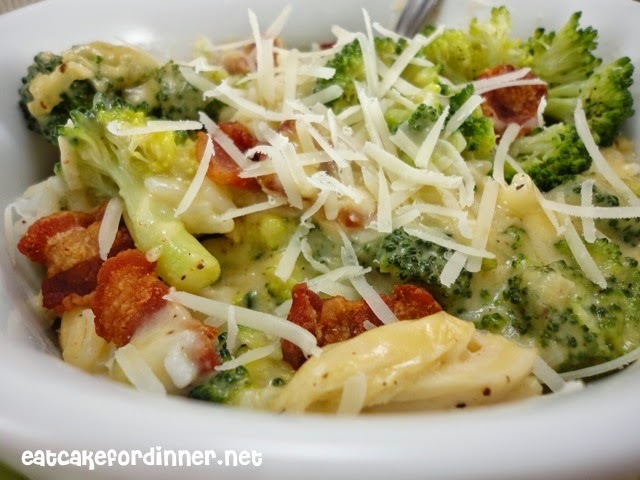 Layer rice, shredded chicken and broccoli in a 8x8 casserole dish. Pour cheese sauce over the top. Crumble bacon and sprinkle over the top. Bake at 350 degrees for 10-15 minutes or until heated through. Jenn's Notes: I typed the recipe above with the measurements that I used. This recipe is quick and easy, especially if you use leftover rice and leftover chicken. I highly recommend NOT leaving the Dijon out, it really took this dish to another level! Made this with ham & used steamed broccoli, cauliflower, and carrots. Delish! I just made this for our family dinner. It was a huge hit!! I used brown rice and heavy cream. All real food! Super yummy. Thanks so much!! I'm so glad everyone liked it. I am loving brown rice lately, I'll have to try it that way next time. This sounds so good. The next time I cook rice I'll make extra so I can have leftovers to make this. Pinning it!